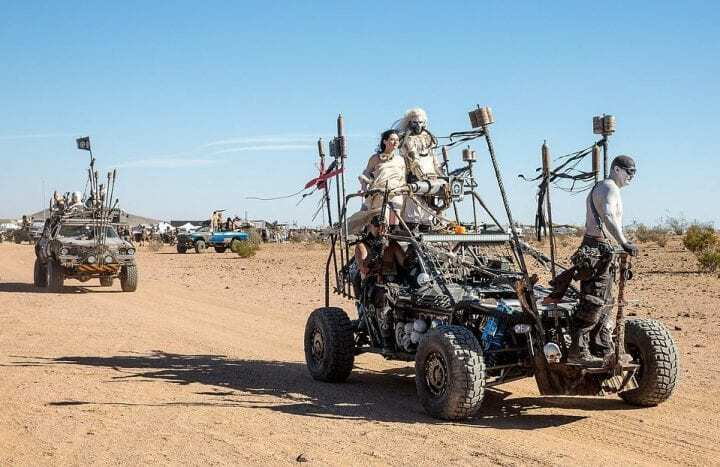 Mad Max rocketed back into the public consciousness thanks to its wildly successful 2015 installment Fury Road, starring Charlize Theron and Tom Hardy. And the most recognizable of all the film’s characters would have to be its ruthless warlord villain, Immortan Joe. No Mad Max-tribute festival could be complete without him. If you thought Batman’s enemy Bane’s breathing apparatus mask was terrifying, then by far this is not the guy you want to meet. With his skull-like face and flowing white locks, you can see his likeness riding atop this tricked-out ATV as he commands an army of fanatic acolytes to rumble onward through the desert.